Central Park is a large park in the middle of Manhattan. 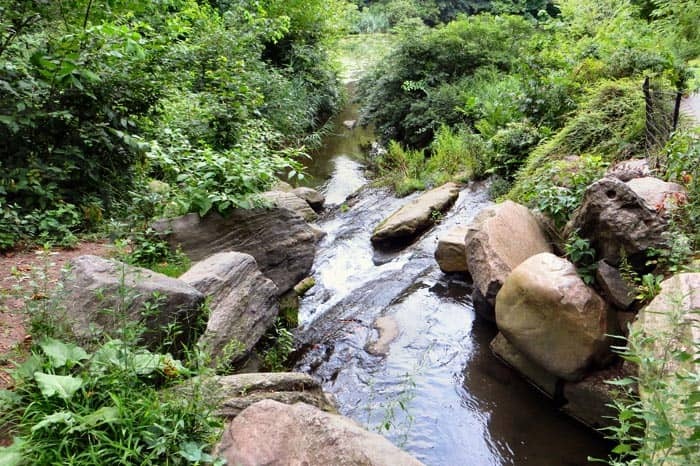 It runs from 59th to 110th Street (and from Fifth to 8th Avenue) and was constructed artificially with bits of untouched nature here and there. The park welcomes up to 42 million visitors a year and is the beating heart of Manhattan. 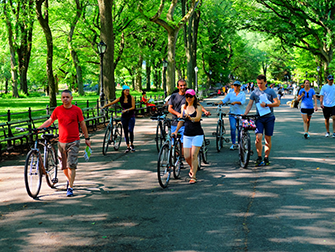 The scenic drives in Central Park are car free, and the park offers a huge variety of attractions and activities. No matter the season, there is always something to do. Eric’s Tip: Central Park is massive, as explained below. You can explore the park on foot, but, if you want to see a lot, it’s smarter to rent a bike. This way, you can cycle through the whole park in a couple of hours and see its main highlights. 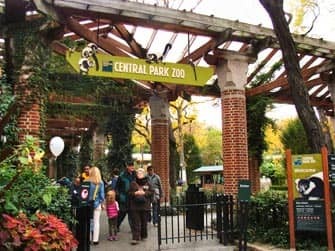 There are many attractions in Central Park: you won’t be able to see everything on your first visit. I’ve put together a list of my favourite attractions to help you make the most of your time in the park. 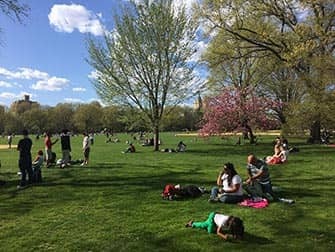 The Great Lawn is a large field in the middle of the park (from 79th up until 86th Street) with baseball and basketball courts and space for numerous other sports. In the summer free concerts are held here. In 1980 John Lennon, known from The Beatles, was shot in front of his apartment (the Dakota Building), near Central Park. 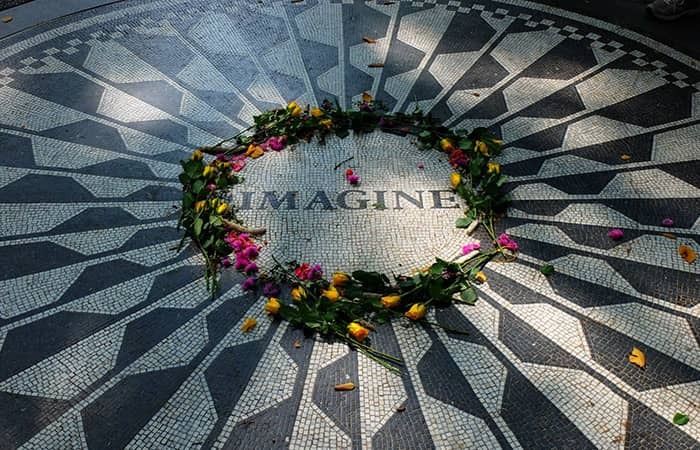 After his death, Strawberry Fields was designed as a symbol of peace, on the spot in the park where he was always happy. Fans leave flowers, poems and candles every day in memory of Lennon. The reservoir was named after Jacqueline Kennedy Onassis in 1994, as thanks for her great commitment to the city and because she liked to go running. This is still a popular place to go running, especially in the spring because the trees bloom beautifully. The loop is about 2.4 kilometres long. 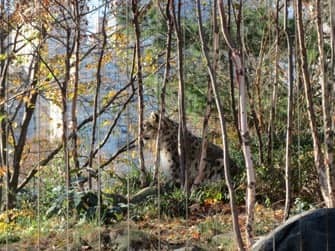 Lions, monkeys, penguins and polar bears, it can all be found in the Central Park Zoo. This zoo was also used in the movie ‘Madagascar’. They also have a special Children’s Zoo, where children can pet goats, sheep, cows and pot-bellied pigs can be seen up close. A castle was built in the 19th century on top of Vista Rock, one of the non artificial rocks in the park (which is 450 million years old!). Until the ‘60s this place was used by the New York Meteorological Observatory to predict the weather. Belvedere is Italian for beautiful views and the castle certainly does its name justice. Sheep Meadow is a lovely place to rest. Many New Yorkers come here in the summer go sunbathing and picnicking. The skyscrapers poke out above the trees, which makes for a pretty picture. Until 1934 it was a pasture where sheep grazed and the shepherd lived in a nearby building that is now a famous restaurant called Tavern on the Green. This is also the place where movies are shown outdoors at the end of August . Admission is free. Tavern on the Green is a chic restaurant situated on the west side of Central Park. Their menu focuses on using local, seasonal ingredients in their dishes. You can have lunch or dinner here in a classic setting with a view of the park. Tavern on the Green is a nice restaurant for a special occasion or a romantic dinner for two. A beautiful garden containing some of the flowers and plants mentioned in the works of Shakespeare. There is also a mulberry tree, which is said to be an offshoot of a tree that was planted by Shakespeare himself in 1602. 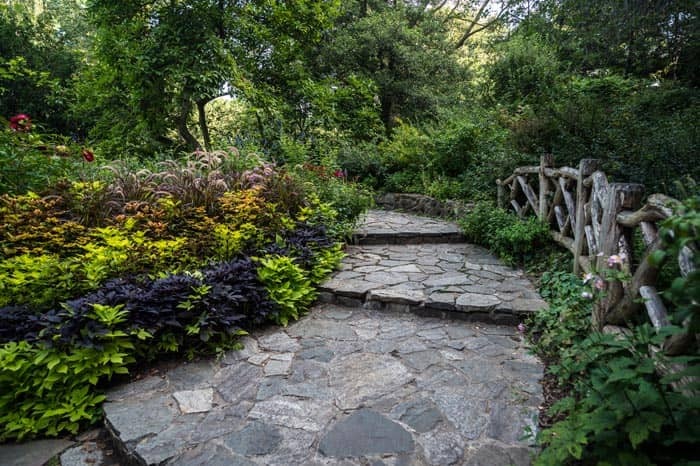 The garden is located near the Delacorte Theater, where from May until August his work is recited during Shakespeare in the Park. This is a wildly popular series of theatrical performances, in which celebrities like Al Pacino, Meryl Streep and Natalie Portman have performed over the years. Free tickets are available but you have to stand in line on the day of the play. There is also a limited amount of tickets for sale. Did you know that Central Park also has waterfalls? Not a lot of tourists know about them, making them beautiful, tranquil places. There are five waterfalls in total, all artificial, and New York’s drinking water flows through them. Enter from the west side of the park at 102nd Street and follow the flow that’s called ‘the Loch’ (up until 106th Street). The Bethesda Terrace is designed as the heart of Central Park. On the steps you have a wonderful view of the lake and the Great Lawn. Under the stairs, because of the good acoustics, street performers often sing or play instruments. In the middle of the square is the Bethesda Fountain, one of the most famous fountains in the world. Also known as the Angel of the Waters, below the angel there are four cherubs symbolising health, purity, temperance and peace. Opposite the Bethesda Fountain, on the other side of the water, lies the idyllic Loeb Boathouse, a place where you can rent rowing boats, bicycles and romantic gondolas. Of course you can also just relax while enjoying a snack and drink, with a fantastic view over the lake. 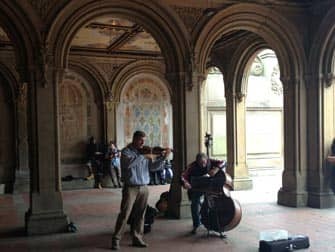 The Naumburg Bandshell was built in 1923 and is Central Park’s only Neo-Classical building, hosting acoustical music events. Elkan Naumburg, a banker and philanthropist from New York funded the construction of the bandshell. When it’s not in use park-goers can usually be found sitting on the stage or just admiring the architecture. 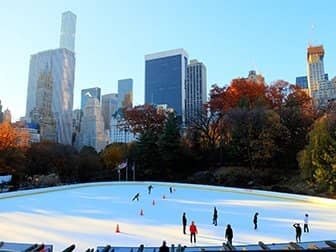 From the end of October until March you’ll find two ice rinks in Central Park: the Wollman Rink (recreational) and the Lasker Rink (ice hockey and experienced skaters). You can purchase tickets in advance for the Wollman Rink. 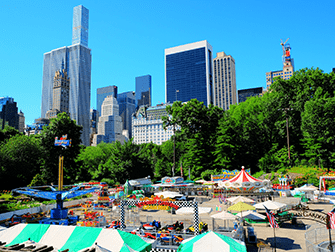 During the summer months, ice skating is replaced by ice cream eating, when an amusement park appears at the location of the Wollman Rink. Victorian Gardens is open from June to September and offers a wide assortment of rides, games, food, and fun for the whole family. Of course you can explore the park on foot, but there are several other ways to get around. 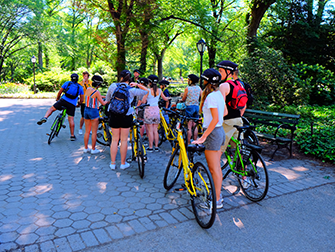 The best way to explore Central Park is by bike. It’s best to rent your bikes in advance, this way you pay less and you are guaranteed a bike. Central Park has a one-way loop making it very easy to cycle around the entire park. Row a boat on the Central Park Lake is classic New York. Rent a rowing boat in Central Park if you want to do something special, romance guaranteed. You combine an hours rowing with a day’s bike rental, so before and after taking to the water, you can explore the park and the rest of the city by bike. I have to be honest, I hate the pedicabs. I find them too expensive and I’d rather rent a bike and bike myself. But if you are going to rent a pedicab, then I recommend you to book it in advance with the below link. That way you know what you’ll be paying. I never recommend renting a pedicab on the spot. Please note that only two people will fit in a pedicab. 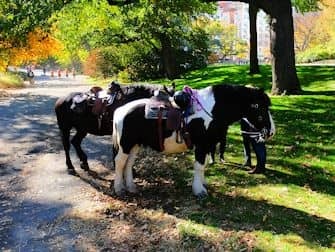 A great and very special way to discover the park is on the back of a horse. A guide will ride in front of you on the bridle paths that lead you through the park. 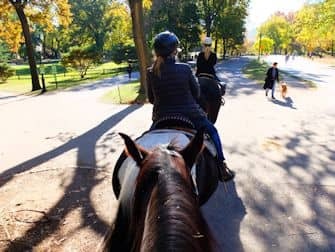 Horse riding in New York is a very special experience. It’s easy and safe, even when you’ve never sat on a horse before! 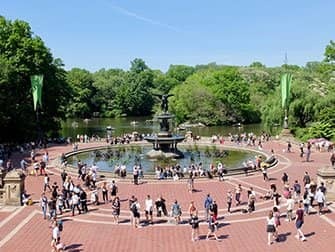 During this two-hour walk, you will learn about the interesting history of the park and its development and you’ll stop at famous film locations including the Wollman Rink, the Boathouse Café, the Central Park Mall and Bethesda Fountain. You will explore the park in a small group. The meeting place is at the corner of West 56th Street and 6th Avenue, just a few blocks from Central Park. Roughly 16 million New York apartments could fit in Central Park!